Frank's Sporting Goods is located on Old 131 in the heart of Morley, 15 miles south of Big Rapids. Stop in and see us for the best deals and service in the area! Frank’s Sporting Goods was established in the early 1940’s by Frank and Alice Deyo. Upon their retirement in 1990, Jerry and June Fellows purchased the store and kept its legendary name. After 18 years, another local family Vic and Teresa Havens, purchased the store and continue to keep the legendary name and customer service going. 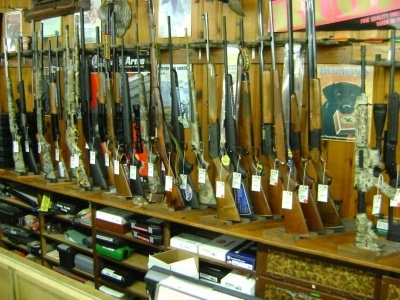 They stock long guns and handguns, live bait, fishing and camping supplies. If you have a firearm that requires “hard to find” ammo, give us a call. The store is open year ‘round; closing only for Thanksgiving day and Christmas day. We do close early on New Year’s Day, Easter, Memorial Day, and Christmas Eve. Normal store hours are 7:00am to 6:00pm, Monday thru Saturday, and 7:00am to 3:00pm on Sunday. 36th st. (Jefferson Rd.) East to Northland Dr. Sporting Goods is on the Right.